Unfortunately, the results were disastrous - 1:3. First two matches were against other simics and I was awfully flooded out. 6 lands in a row was in the first match after initial drawing. The second was bad also. The opponents were quick, had lots of flying creatures and did not have similar problems. Then one win against gruul. Then against a loss from orzhov deck (pontiff and acrobat were very persuasive). My previous matches when i had gruul decks were much better (6:3). A question to you: do you mulligan when you have a hand with 4 lands and only 1 playable creature in the next 2 turns. 4 lands with a 2- or 3-drop is almost always a keeper to me. I unfortunately can't say more due to not knowing what exactly were the remaining 2 cards in your hand. You're playing Orzhov splashing Blue off one Azorius Guildgate, one Gateway Plaza and one Azorius Locket. Orzhov Guildgate, Plains, Mortify, Lawmage's Binding, Syndicate Messenger, Undercity Scavenger, Grasping Thrull. Depends on the rest of the deck composition I think. Running 17 or 18 lands? Any faux-cyclers like Bladebrand, Consecrate, or Depose in the deck? Running enough two drops that drawing into one is reasonably likely? Perhaps a mull you're a late game value deck and don't have any any of those to bail you out if things go south, but otherwise it looks like there's enough upside that it's a fine keep. I'd snap keep. There's little chance of me mulling a 2 lander unless there are like 2 6+ drops in it. And that hand has solid plays from 3 onwards. Now you need 2 lands and one three drop is probably uncastable so that complicates things, but a mulligan isn't likely to do much except remove a card. Granted I've kept 2 landers and not gotten there, but going down a card to have a small chance of a better hand seems very wasteful. Keep you got good mana, removal, creatures and some lifegain... if things go sour. If the deck has 4-6 2 drops then is a slam keep. I would definitively keep it. On other news... I think I'm starting to get a better grasp of this format, Gruul has been performing solid with 5-6 wins per run but Orzhov is finally coming together more consistently. I build a very cool Gruul deck the other day that went 6-3 but it was amazing to play... it had some Savage smash a couple of big fatties and like 4 Sauroform Hybrid... that guys has come out rather late and even wheels, which I find nuts coz that is one amazing 2 drop! Bots are mad! Anyway apart from the Gruul deck I also had 4 goblins gatherings 1 team pump spell, 4 gates, one Ram, one Colossus and one gate ablaze.... the deck was all over the place but man that thing was so fun to play... so many angles for attack... It was a shame I could not take it to the 7 wins. I think Gruul is very good for that but needs to grab 2 drops and tricks, pressure your opponent to trade down and then close games with those 4-5 cmc fatties... but the deck needs early aggression in order to work well. I would definitely keep. There is a high chance that we will have one more mana and then we have some interaction with opponent, and if in the next 4 turns another mana comes we put syndicate messenger. I have almost always another problem- overflooding. but a mulligan isn't likely to do much except remove a card. I hate mulliganing too, for it feels like whenever I go down to 6 I also go down to 5 and those become instant-concedes on a too regular basis. 1) The format is slow, you're not getting overrun. 2) Card advantage is king, don't throw away one or even two for nothing. That being said I tend to keep everything with 2-4 (sometimes 5) lands if they provide my main color(s). My own meta so far has been mostly Gruul with a blue splash, sometimes the other way around. A few decks were Orzhov but while that's supposed to be strong, it's neither been much fun (zZzzz games) nor too successful. Gruul is great though, I'm already filling my Vault with Rhythm of the Wilds and Savage Smashes. 56-32 through 13 runs now, hit platinum earlier Still haven't seen Gruul open in draft, and the two times I tried Rakdos were disasters. Finally got to play the High Alert deck, hoo boy that creature package is stinky until Alert comes down. Not sure if I'm trying to do too many things at the same time (the mill plan, gate plan, High Alert plan), or if I should run Humongulus + Watchful Giant to go along with the two High Alerts. Really weird deck/draft IMO; something must have gone wrong for you or you may have misdrafted. High Alert did absolutely not get there for you. You have a total of maybe 7 cards that profit from it, 2 of them have conditional evasion. You have none of the creatures it goes well with (Azorius Knight-Arbiter, Concordia Pegasus, Senate Courier), and in reverse the cards that profit from it are bad to unplayable otherwise (the format's too slow that Walls could ever be an effective card; Screaming Shield is kinda bad as well). Also, your mana will be horrendous despite 7 Gates. Mass Manipulation is insanely taxing on your manabase, as is the too broad Black splash. The format is slow, but it's not Dominaria where you can splash In Bolas' Clutches off 3 Islands. You could go for Arrester's Zeal over Humongulous to lower your curve a bit, but at that point you're down to 12 creatures, most of which are expensive, so I'll take my additional consistency to drop _something_ on 5 mana (which is appreciated by the Locket as well). Manabase should probably be something like 3 Orzhov Gates, 2 Azorius Gates, 1 Swamp, 3 Plains, 9 Islands. 18 lands because your curve is too high and your manabase is wonky. No Simic Guildgates; you don't have enough payoff for them and you need a decent number of untapped lands to reliably play your stuff to not get out-tempoed more than you already are. 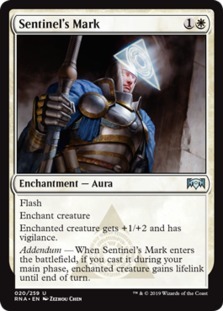 Azorius and Orzhov gates are absolutely needed for manafixing though. You need that much Blue (11 sources plus Locket) because you'll draw a ton of hands where you need to cast turn 3 Thought Collapse to not fall completely behind and need to reach quad-blue at some point to even cast Mass Manipulation. 8 White plus a Locket will have to do; I don't think you can get away with less because of your white 1- and 2-mana cards, but at least you don't have double-white so I guess that number is fine. I'd like another Black source (mainly because of your otherwise really hard-to-cast WB cards), but there's absolutely no room for it. Oof. That pool is almost good for 2 different decks, but a few cards short of making either. I think mill is a viable alt win con in UW High Alert decks with the mill walls (where if you don't draw Alert, you can mill behind your line of defense), but you only have 1 mill wall and not enough other stuff to really justify the Alerts. Because of that, I'd ditch the mill plan entirely. A large part of me thinks the way you'll win is by gaining a ton of life with Gateway Angel to bring you back from the brink after slow starts, giving you time to beatdown with a recursive Colossus. For that reason, I'm not sure cutting the Simic gates is correct. If you cut the walls, you only have 5 creatures you can cast before T5 (and that's assuming you hit all your land drops). You have 1 Judgment to add by subtraction - and a pair of counterspells that are going to be unreliable on curve in a 3 color deck. Then, with the exception of Battlements, your 4 and 5 drops are 2 and 3 toughness - which won't block particularly well if opp is applying pressure. Due to those numbers, I believe the Angel lifegain will be very important. I think you have to accept a necessary evil here - run the Simic gates or run some of the walls. I'd choose the gates because without High Alerts, the walls will be Bad, where as the gates will keep your Colossus coming back, your Sneak unblockable (and synergizing with Colossus recursion), and your Angel salvaging your life total. Well it's my first ever RNA draft, so I'm bound to make mistakes! On the other hand, the deck went 7-2. Amazing. I played against some bad players courtesy of low rank, but in the last game I beat a mythic player @ 200+ rank. Fantastic game too. I think I had a nice matchup advantage (he was on a dedicated mill plan, which obviously doesn't work well against my deck), but the last play of the match was epic. I'll put that into the play of the day thread. -1 High Alert: on the grounds that drawing two is bad, and as you said I don't have the real payoffs. On the other hand High Alert disabling Sky Tether is big game, and it works well with Screaming Shield. 1. High Alert + Screaming Shield was great in one game, but I doubt it's a combo worth going out of one's way to play because Screaming Shield's activation cost is so large. 2. The large amounts of lifegain. I was able to stay alive easily against many opponents. Grasping Thrull was great, so were Archway Angel & Consume//Consecrate (especially after what the latter did in the last game LOL). 3. The high-toughness creatures were able to hold the ground while my flyers did work in many games. I think it was the right decision to keep the walls. I did have trouble with afterlife though if I couldn't stick a flyer - that is one great mechanic. Nice! Cool to hear you kept an Alert in and had a winning run with the deck. What's the pick? 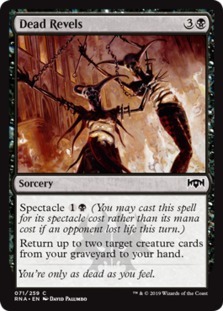 I'm guessing, based on my still-little experience in the format, that Skewer the Critics is the strongest of these cards, but Ethereal Absolution is so much of a bomb that I should try to pick an on-color card in which case I should take the Oligarch and force the bots off Orzhov. What do you guys think? Doggie isn't a second pick. At this point in the draft you don't even have bomb you'd want to protect. 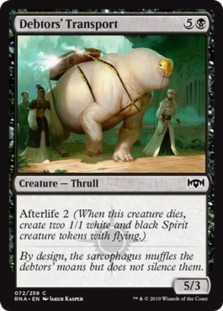 Will be very meh if you wind up with a pool of basic Orzhov creatures. The others are better 2nd picks, but I wouldn't take Ceratok or Arnyx. Absolution is arguably THE best card in limited, and having it fist pick should keep you in range of BW for rest of draft. If you take Absolution P1P1 and don't have it in your deck at the end, something bad happened. Green doesn't splash well with BW this set, and it doesn't seem wise to force yourself into a gates deck this early in the draft without a gate payoff already. Esper and Mardu are easily splashable, so Spy and Skewer are worth considering. Spy better if you have green for Riot or Adapt counters, so maybe 3rd best choice. Wouldn't be a terrible pick tho. Skewer is a good card and taking removal early is almost never Wrong. That said, I think Esper is better in Limited than Mardu. Mardu needs some rares and uncommons to really shine where Esper can do better with U commons/uncommons. Red commons you'd want are mostly burn, and BW has a bunch of removal options already so you get into an issue of redundancy. Real Talk: maybe Spy and Skewer are closer to a coinflip here if you don't want to pick grandma. I'd take Grandma. Grandma is a great 2 drop in Orzhov, and the safest pick since it sticks to 2 colors. I'd take her and hope to pick up on color removal later (between B and W you're bound to have options). Ok thanks, I'm going to force Orzhov when I finish the draft. Doesn't have to be Orzhov. Could be Azorius splashing black or Rakdos spashing white (tho Rakdos is the worst guild in limited, imo - if you see Judith or Rakdos himself, be worth considering). Absolution as a 6 mana spell could be a splash color. Could even be a gates deck if you see good payoffs. With 2nd pick, I like grandma from what's available, but don't feel trapped to force it with bad picks. Any updates? Inquiring minds want to know! RNA BO1 draft rotated out, so I didn't get to play a single game I'm massing gold again for when it rotates back. So i have dipped my toe into some drafts, BO3. My first couple decks crashed and burned, had some dope rares but never drew them. I had a decent run with a strait orzhov deck stopped at 4 wins. I drafted this no rare trophy deck, started simic then went full gates after catching 2 gate colossi in pack 2. Went 5-1. + skewer in the main and a Savage Smash in the sb and white for a lone Archway Angel that saved me from defeat more than once. I only had one game with mana drought and never felt color screwed. What i really want to know is what does Modulo think of the mana base? "If there can be no victory, then I will fight forever."